"I'm not in the website building business, but I'm pretty sure that six weeks is pretty stinkin' fast…we saved a lot of money on Chops. " 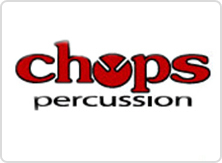 Chops Percussion is an educational percussion company run by percussion educators, combined with the service and support of one of the nation's best school music dealers. 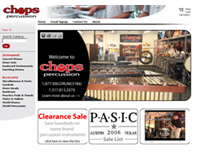 Chops is a full stocking dealer for concert percussion, marching percussion, drum set (educational), and world percussion. Chops Percussion is a brand new division of Paige's Music of Indianapolis, Indiana. They needed a strong web presence but only a temporary static website existed prior to the solution provided by PlanetJ Corporation. Along with a way to present information to potential customers, an online catalog was a must. 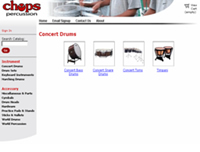 If you're shopping for bongos, snares, cymbals, or any type of percussion equipment, you can find it all and shop for it conveniently through Chops WOW e-commerce site. By navigating through the left-hand menu items, the user can view available instruments. More information on each product can be obtained from accessing menu item mentioned above.By clicking on details here, the user is given pricing and shipping information.Let's check out the available concert snare drums. 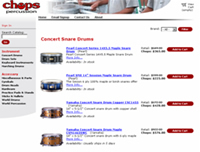 Various drums are presented to the user along with pricing and sales items. Or you may drill down to further details on the product, see an enlarged picture and see if it is in stock or not. From either screen above, the user can add the item to their shopping cart and receive suggested products page seen here. At check-out, the user is asked to log-in or create a new, secure user account. As shown below, the user is then prompted to enter account information that is stored on the i5. Because most of the layout and features mirrored the Paige's Music website that was also built by Planet and the WOW product, PlanetJ was able to build the Chops Percussion site in about six weeks. Tim Gee, marketing manager at Paige's Music, comments, "I'm not in the website building business, but I'm pretty sure that six weeks is pretty stinkin' fast…Also, by combining previous work done on the Paige's site, we saved a lot of money on Chops; almost two sites for the price of one." Tim has already begun receiving positive feedback from their customers: "We've already received several positive comments on the site and we look forward to using PlanetJ to enhance it even more in the future."